Aboriginal Canadians are those who identify as First Nations/North American Indian, Métis or Inuit. 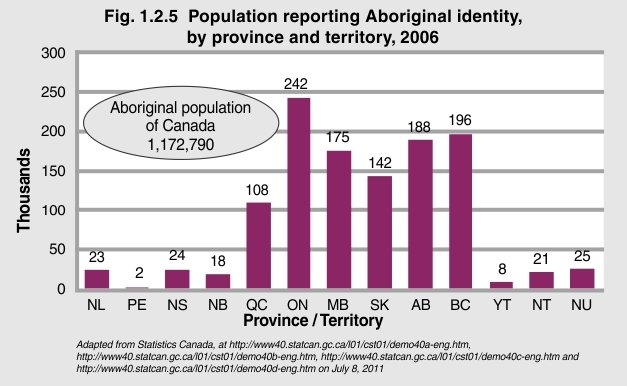 According to the 2006 Census, Canada’s total Aboriginal population was 1,172,790 people. While the largest Aboriginal population (242,495) is in Ontario, many Aboriginal people live on the Prairies — Manitoba (175,395) and Saskatchewan (141,890) — as well as in the western provinces — Alberta (188,365) and British Columbia (196,075). In the years to come, there is expected to be huge demands on Canada’s labour market because of the increasing number of retiring baby boomers. As the non-Aboriginal youth and young adult population shrinks, there is potential for Aboriginal youth to benefit significantly. In preparation, Canada’s leaders need to find ways to ensure that Aboriginal children and youth receive the education and employment skills necessary to take advantage of the opportunities that will inevitably unfold, and to have the opportunity to fully participate in Canadian society.